The Young Elites | What YA Reading? I picked up the novel’s sequel, The Rose Society, immediately upon capping The Young Elites, so you’ll have to forgive me if throughout this review the books begin to bleed together. I’ll endeavour to limit my jive to the series debut, but I make no guarantees. Set in a loose rendition of Renaissance Italy, The Young Elites features the survivors of a blood fever that ravaged a world. In Kenettra, those who were untouched by the disease remain pure of heart. Those who contracted the illness and lived to tell the tale, however, are malfettos: they are disdained, they are resentful, and they are waiting. For there are those among them who possess gifts beyond imagination, and despite being a new fantastical translation of the Island of Misfit Toys, they are ready to fight back. In this sense, at least, The Young Elites is teenagedom to the nth power: dark and angsty yet burning brightly, a fantasy wherein every event is the apocalypse and every ex is Beelzebub himself. Within these pages Marie Lu has perfectly captured the essence of (smells like) Teen Spirit, complete with hoarse vocals shouting at us to turn off the lights. The romance is conceivably the most transcendent component of the novel. Or perhaps I should say the lack of romance– indeed, Marie Lu does in no way grace us with even a modicum of spray tan love. We are left instead with a swarthy prince on the rebound, a beautiful male courtesan not currently occupied in a love interest-type position, and a silver-haired sweetheart who just wants to be loved. The results? Minimal (although extant) amounts of pining, kissing, and other such youthful debauchery. Many of you may find this to be thoroughly tragic, although personally I was quite (wickedly) pleased. Because as Marie Lu herself might tell you, given the opportunity and hopefully vast expanses of caffeine, our Adelina has enough on her plate without adding relationship melodramatics to the mix. She’s already struggling with a missing eye, unconstrained power over all human senses, and an accidental patricide issue with a dash of autocratic reign. She simply does not have the time nor the inclination to rewrite her story of epic villainy as a sensual romance. 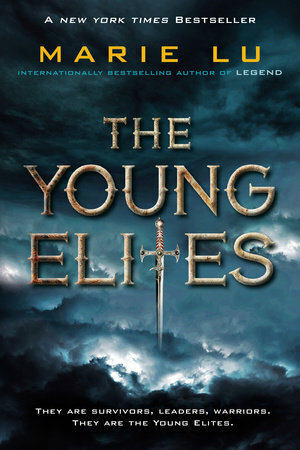 Yes, The Young Elites is above all a tale of antiheroes. There is no right, no wrong, no moral of the story. There is only power, and the lengths to which one may go to achieve and maintain it. This makes all of our characters fundamentally interesting, Adelina the most so. For she is karma incarnate, the right hand of revenge, and her wrath knows no bounds and no apologies. And yet we as readers are asked to sympathize, to understand the whys and wherefores of her actions, and ultimately to accede them. For this reason, Adelina cannot be a villain in the strictest sense of the word, for we readers are perpetually aware, in some dark corner in the back of our minds, of where our loyalties should lie– and that is with the protagonist. The narration is quirky and at times hard to follow, but I like it, and will keep coming back for more. It is with breathless anticipation and no small supply of apprehension that I await the trilogy’s conclusion, to be published October 11th. Until then, Marie Lu, I wish for you copious mirth and perhaps a trifle of humour for your toolbox. You never know when you’ll need them. Recommended for fans of tortured souls, macabre downfalls, and eyepatches. 4.3/5 stars.